And there’s more! For each machine sold in our KMIS locations or through our e-commerce option at https://www.kmisinc.com, we will add another $25 for a total of $50 per machine sold through our places of business during the month of September. We hope you will join us all through September as we highlight National Childhood Cancer Awareness Month AND National Sewing Month (our worlds collide!) with this new and exciting Janome machine. We’re inspired and we hope you will help #sewupacure! Watch our FaceBook page during the month of September to participate in our fun photo campaign and help us share this with the world through social media! As many of you know, it’s a cause very close to my heart. We want to make a difference in funding much needed research for children with cancer so please help us #sewupacure! 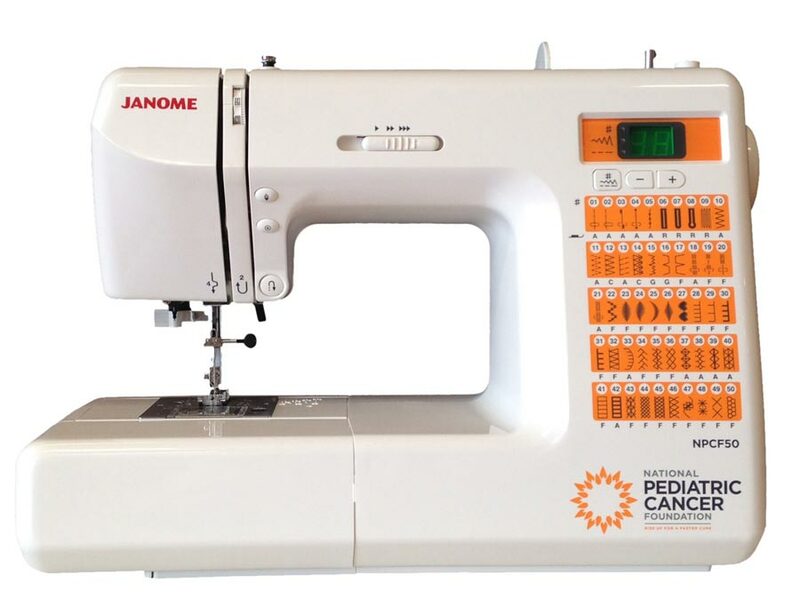 When you purchase and NPCF50 from Keep Me In Stitches $50 from every machine will be donated to the National Pediatric Cancer Foundation — $25 from Janome America and $25 from Keep Me In Stitches! Help us fund much needed research to end pediatric cancers. The Janome NPCF50 brings the features you need to complete any project: home dec, garment sewing, scrapbooking, or quilting. Fifty stitches, including three buttonholes, give essential variety for your diverse sewing needs. You’ll also find a variety of easy convenience features, including an auto-lock button, easy reverse, and a speed control slider. The NPCF50 also features the stability and dependability you expect only from a high end machine, allowing you to sew with precision and confidence.